Please telephone 020 8968 2350, fax 020 8964 3221 or e-Mail lucye@mayhewanimalhome.org.uk for further details. The Mayhew Animal Home Trenmar Gardens London NW10 6BJ If you are interested in adopting an animal, our viewing times are: Tuesday to Saturday between 1pm - 3.30pm. No appointment is neccessary for these times but there will be a waiting period, particularly on Tuesdays and Fridays when we tend to have more visitors. Sandy is a 1 year old buck rabbit who originally came to the Mayhew as a 2 month old kit. 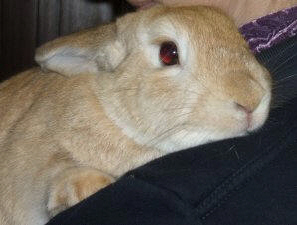 He was bonded with a non-Mayhew rabbit that has since died and sadly Sandy is looking for a new forever home and partner. Since he has grown he has become the most handsome young man. With his light coloured fur and a small patch of black around the right hand side of his neck, resembling a lion’s mane, he has striking good looks that everyone comments on. Sandy has always been shy and gentle. He loves being around people and other rabbits and is very inquisitive but will keep his distance preferring to watch, letting them make the first move. Once he has given his trust, he lets you know, giving little nudges of appreciation and by being around and about you generally. He loves to be stroked on the nose and tickled behind the ears. The trick is to let him get used to you gradually before making a sudden approach. Kind words and encouragement go a long way with him. Sandy dislikes noise and sudden movements and for this reason he will be better homed in a quiet environment preferably with adults or older children only. He is easily handled providing you are confident with him and he feels secure and with the right TLC he soon learns here is nothing to fear. Sandy has been a house rabbit but could equally be an outdoor pet. 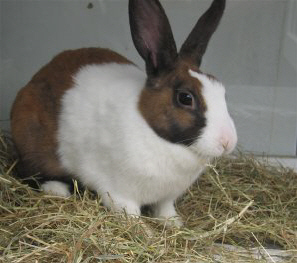 He will be bonded with another, perhaps more confident, Mayhew rabbit and will, therefore, be homed as one of a pair. 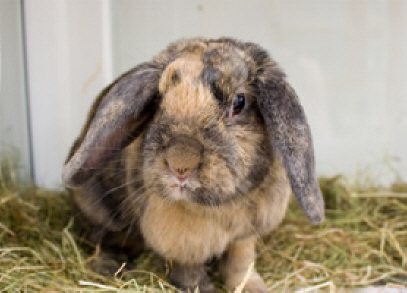 Alternatively, if the right partner cannot be found he could be bonded with a non-Mayhew rabbit looking for a partner. 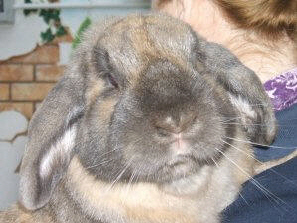 Gus is a lop eared male, he is a chunky but truly charming chap who simply loves people and being around them. As soon as someone walks by he runs up and down excitedly trying to catch their attention. If this fails to work then he picks up the nearest object in his mouth such as a toy or piece of paper and frantically rushes around whilst looking as cute as he possibly can. This usually does the trick and the lucky person is then treated to the full Gus repertoire. This includes standing on his hind legs with his front paws on the person’s leg, nudging the person and following them when they try to leave. Gus is a fearless rabbit who doesn’t always know what’s good for him and who has the capacity to get into all sorts of scrapes through his curiosity in exploring and meeting other rabbits and animals. Luckily his trust in people sees him through as he nearly always comes back to them when he is called. His new carers will need to keep an eye on his antics and be careful that he does not get underfoot. 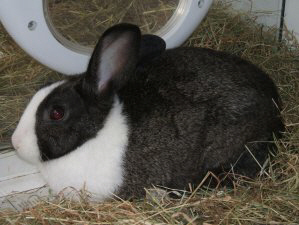 Gus is confident and lively rabbit who is used to older children and to being handled. He would make an excellent indoor or outdoor rabbit but above all he will need constant company plus a stimulating environment to satisfy his love of life. Gus will either be paired with another Mayhew rabbit or could bonded with a pet rabbit looking for a companion. Bowie is a Netherland Dwarf buck who was sadly abandoned by his keepers. This cool glam-rocker is sure to rock your world. He may be small but he has a big personality and is predominantly white with striking markings around both eyes. He settled into the Mayhew community immediately upon his arrival, taking centre stage with his surroundings and his new band of companions alike. He is very friendly and has made a welcome addition until he finds his new forever home. Like a true superstar, he is never shy about coming forward, is always there to greet you, and curious to know what you are doing, but if you just feel like chilling out with him, he’s the rabbit. He is naturally sociable, enjoys attention and meeting new fans, and particularly likes being deferentially stroked on his nose. Bowie is used to older children and would make a good house or garden companion and will need to be bonded with an existing pet rabbit or a Mayhew rabbit. Give him the chance and he is sure to become your hero! 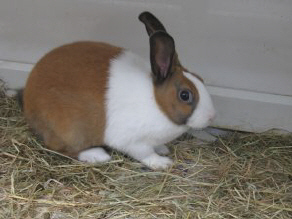 Snufflebum is a 14-16 month old tri-coloured buck Dutch rabbit. Since arriving at The Mayhew he has come out of himself and now eager to explore his surroundings. He is the naughty boy of the Mayhew rabbit community and he never fails to make his carers laugh at his antics. Snufflebum has two favourite pastimes – chilling out and playing. His favourite trick is watching eagle-eyed from afar, waiting until his accommodation has been cleaned and freshly restocked before immediately rearranging it all in his own particular style, flipping his toys everywhere and shredding the newspaper, so thoughtfully provided by his carers for his convenience. Snufflebum is very sweet natured and thus easily forgiven. He handles well settling down for a cuddle whenever someone is prepared to spend time with him. Since arriving at the Mayhew Snufflebum has been treated for snuffles, which may or may not recur in the future but he could be treated at Mayhew prices. Because of his former condition Snufflebum would be better suited to an environment with a steady temperature and as such would make an excellent single house rabbit in a home with adults and older children. Who could resist giving a forever home to this little sweetheart? Petal is a very friendly grey and white doe Dutch rabbit that came to The Mayhew with 8 other Dutch rabbits that were the victims of an uncaring breeder. Petal loves coming over to you to say hello and to see what you are up to or just in case you have a tasty treat lined up for her. Otherwise she likes nothing better than chilling out and can often be seen lying on her back in the middle of her garden taking in the atmosphere. 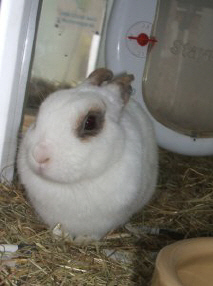 Petal would be suitable as either a home or outdoor bunny and can be bonded with an existing rabbit. Otherwise she will be bonded with a suitable partner at The Mayhew and will be homed as one of a pair. 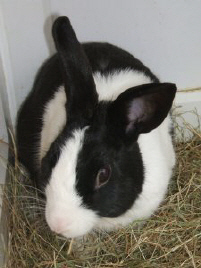 Snuggles is a handsome black and white Dutch male rabbit who has settled into The Mayhew rabbit community well. He enjoys meeting people but can be a little shy at first. Once he has decided that you’re okay he is happy to be stroked and petted. Other times he is happy to chill out in his litter tray and simply watch the world go by and enjoy your company from afar. 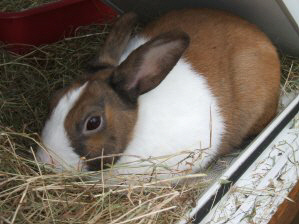 Snuggles would make a good outdoor or house rabbit and can be bonded either with a Mayhew or pet rabbit in due course. If you’re interested in offering Snuggles a perfect, loving, fully-committed, lifetime home or would like to know more about them, please visit The Mayhew Animal Home any Tuesday to Saturday between 1pm – 3.30pm. Bunny is a beautiful 3 year old doe lop, who came to The Mayhew owing to her owner’s ill health. Bunny has happily lived indoors, being a loving companion to her previous owner, with free run of the house which she enjoyed exploring. Bunny loves her food and is particularly partial to carrots, sprouts, apple, cauliflower and broccoli. She is used to being handled and groomed, simply enjoying the attention. Bunny is used to having lots of company and attention and would therefore need a carer who will be around most of the day. She can be wary of young children, and would therefore suit an adult household. If you’re interested in offering Bunny a perfect, loving, fully-committed, lifetime home or would like to know more about her, please visit The Mayhew Animal Home any Tuesday to Saturday between 1pm – 3.30pm.